COSTA WAEZ: Now I’m going to talk to you about the different hookahs, the color, the size, the type, what’s the reason they are different and why they are different. Let’s talk about the first one. This one is made from wood and this one was used for the tobacco but not tobacco flavor. And this one is originally from Iran, the tobacco that was used for this one. These are the more modern hookahs. We used the tobacco on it with the flavor. This one you can use one, two, three hoses; and three people can smoke in the same time. This one is just small. You can take it with you easy, anywhere you can go, and you can enjoy smoking without worrying about having a big baggage. Hi there. Paul here for hookah.org. Thanks for joining me today. I’ve come here today to teach you about hookah etiquette. 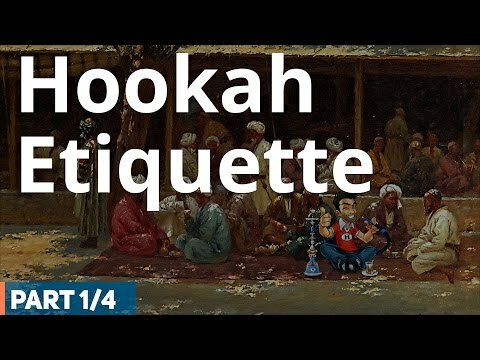 The first and most important piece of hookah etiquette that you should keep in mind is to actually pass your hose. What I mean when I say that is that if you’re going to setup a hookah session around friends, you should always offer the hookah to everybody. Don’t let everybody feel excluded. Don’t sit down and just puff on the hookah yourself and say, “I did all the work, I set this up, it’s my rig and my tobacco, therefore no one else gets to partake.” Hookah is supposed to be a communal thing. It’s supposed to be an inclusive activity, so give everyone the option, but remember, it’s an option. Make sure to offer the hose and say, “hi, would you like to try this, would you like to be including in the session. No? Not a problem.” Remember that is your choice to smoke hookah, it is their choice whether or not they want to as well. Don’t be pressuring; don’t be a jerk. On the same note, make sure to keep the rotation moving at a good pace. You want to smoke for maybe two or three minutes at most and try and encourage your guests to do so as well, and then pass the hose to the next person in the rotation. Two or three minutes is plenty of time to get quite a few puffs in and enjoy yourself, get a taste for the hookah, enjoy the nicotine and then move it on. If you keep that pace going, remember that each session, if you’re packing your bowls right, should be an hour at the bare minimum. You’re going to have plenty to smoke. You don’t need to eek out every last second. You don’t need to try and keep it all to yourself. Give everyone an equal opportunity. On the note of rotation, remember that you should establish a rotation and stick to it. Traditionally a rotation always moves clockwise, so always pass to the person to your left. You shouldn’t skip anyone. Don’t forget about Jim over here on the side and move it over to Mike. Just make sure to actually offer it to the next person, they will accept or deny and if the person next to you doesn’t want it, move it to the person next to them. Don’t skip around. This mixture again everyone has an equal opportunity to enjoy the session. .